So my fight was rough. I self-diagnosed myself with a very minor concussion because my opponent’s hooks were like bricks on the sides of my head. Good job, to my opponent. One of my goals is to increase my punching power and get a KO some day. Anyway, I’m really lucky to come out of the fight with no other injuries. Thankfully, I’ve never gotten anything very serious like broken or torn, whereas some of my friends have had broken hands, limbs, broken facial orbitals, eye injuries, etc. It’s a tough sport! Sorry, don’t mean to be morbid, but just stating all the things I’m grateful for! I was dizzy for 30 mins after the fight, had a headache until the next day, then that went away and I just felt a little uncomfortable until Monday. After that, I felt pretty good. I didn’t take any chances, though, and didn’t get on the mats other than to teach kids. I constantly iced my head. My Cryohelmet came in VERY useful. Shoutout to my http://www.cryohelmet.com/, one of my sponsors from my Invicta days! 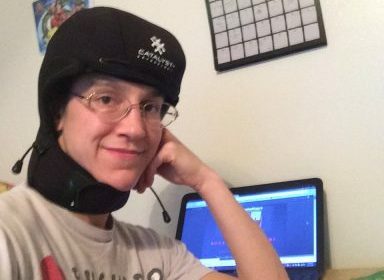 It’s a helmet with inlaid ice packs and is good for headaches, migraines, and concussion symptoms. I guess I wasn’t as bad as I thought originally. I did some very light jiujitsu drilling on Friday and Saturday. That made me super happy! Today is Wednesday of the next week, and I’ve been live rolling jiujitsu, just no kickboxing. I went over the first round of my fight with my jiujitsu trainer Mike and he gave me feedback and praise. That was nice. I know that I need to put this fight behind me and get back to training. Once I become stronger and better, I can get further and further away from the loser me. There was a science experiment where scientists had two rats fight, and then they isolated the loser. After a week, it died. They did it again but put the loser rat back in the back. Within a few days, it started acting normally again. I KNOW that I need to surround myself with friends and nakama as much as possible. When I sit home alone, I’m sad and cry, so I go out, be with people, and do stuff. Every night last week, I went out with somebody for dinner! 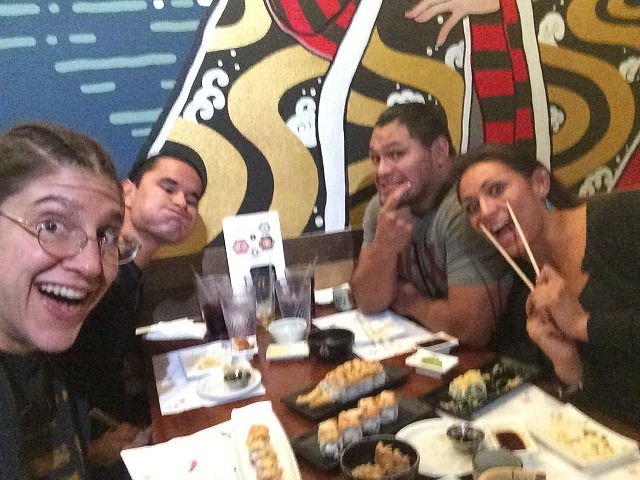 I ate sushi, BBQ meat, Fuzzy’s tacos, SkinnyFats restaurant, ice cream, all the yummy food! 😀 It was really nice. Monday, I bought a new iPhone! John had been encouraging me to get one for a year, but I had a 5s and it wasn’t really broken. Well it kind of was – the silent mode button was – and I had run out of space, but it was still usable and I’m thrifty as heck. I bought an iPhone 8 and had to go through a huge rigmarole to get my Boost Mobile service to transfer over. Also, I finished up my new BJJ Syndicate Kids testing system and explanation sheet. 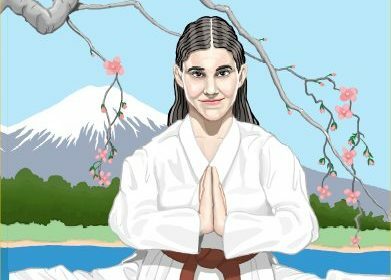 I had talked to John and Mike about it at great lengths on our New York Trip and I figured out a new reward system using The Rainbow rope, Martial Artist home training, and pursuing physical goals. Now I just have to explain it to all the parents, test everybody’s abilities, and hand out ropes. I’ve been doing it little by little when I’m able to catch the parents. I got it all printed out and stuff on Monday. 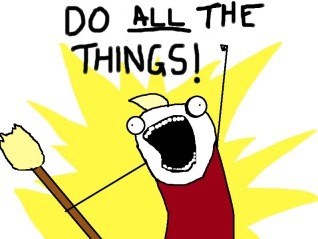 I cleaned and picked up the entire apartment. It’s AMAZING how much energy I have when I’m not training. Tuesday I had a car appointment because my dashboard lights went out, and the guy told me that I accidentally flicked a switch that turned it off. LOL SWEET. Free fix. (I feel dumb) I then had lunch with Mary, aka Mamawood, who I’d been meaning to hang out with for like a year and we never had the chance. I did some pull ups. Then I had dinner with G and Dana. Wait, am I supposed to be resting? I’m a Modafferi! We don’t know how to rest! You guys have NO idea the lengths my family members go to. Haha Some have life-threatening illnesses but they are up and doing everything, cooking, taking care of kids, working, doing stuff. Everything but laying down. It’s crazy. I’m proud to have Modafferi blood running through my veins. We accomplish so much. It’s a fire inside. My Dad is so awesome. He worked his way through college, eventually achieving a masters in Math, and is a very successful businessman! 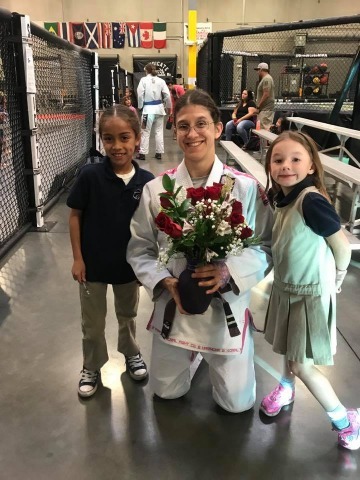 My students Ky, Autumn, and their parents got me flowers! <3 Thank you! I feel so loved. Wednesday, I decided to do something I’ve always wanted to do! 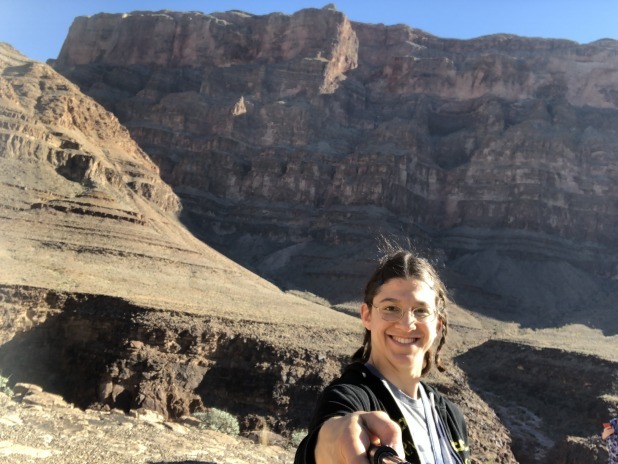 GO TO THE GRAND CANYON! The four-five hour drive had always put me off. But wait! 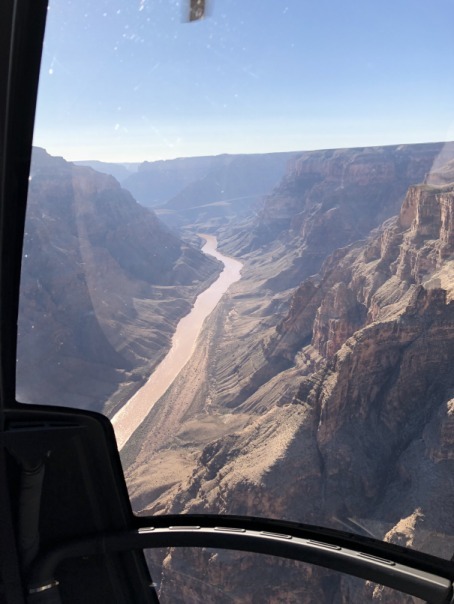 There are HELICOPTER TOURS! Which as expensive as heck! 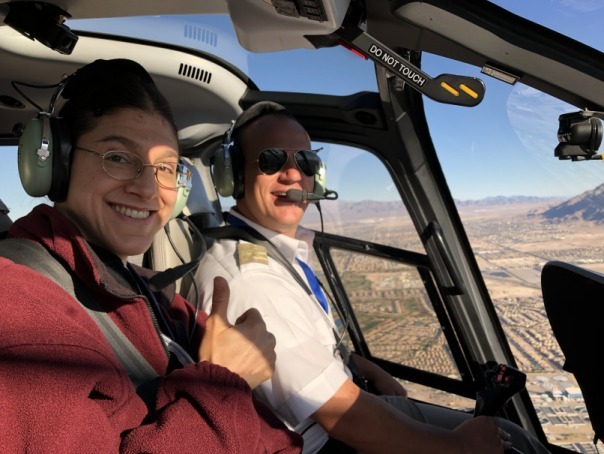 But why shouldn’t I treat myself to a helicopter ride? 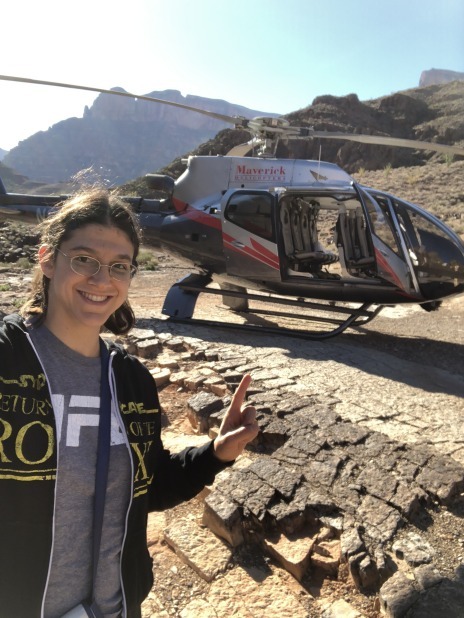 I’m never going to justify the cost ever again, except during the week after the fight where I just made some money, and when am I ever going to have the chance otherwise to ride a helicopter? So I did it by myself! It was SPECTACULAR!! I’m so happy I did it! I got to sit next to the pilot on the way over there, and in the back on the way back. He was super cool. He played “Ride of the Valkyiries” on the ipod he had hooked up to our headsets when the Canyon came into view. Hahaha that was great. We landed near the bottom and walked around!! Thursday, I think it was Thursday I drilled some grappling with Serena? Learned cool stuff from Mike. John was in Russia cornering Cory Hendricks. I rode the New York New York Roller coaster with Serena!! I’ve always wanted to! I thought there’d be huge lines and I thought it would cost $28 cuz I read that some where. However, it only cost me $12 and there was NO line. Welp, I dunno what to say. LOL Yay?!? 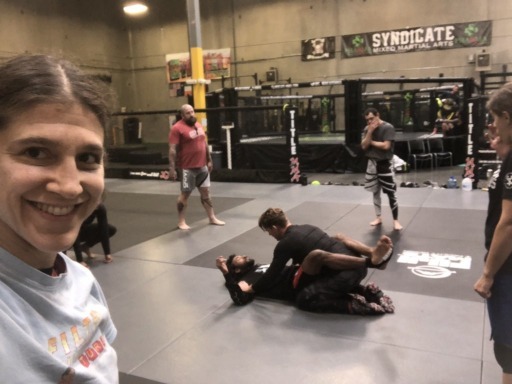 Saturday, I did BJJ technique class at Dunham’s and then went to Syndicate, where Mike Pyle rolled super lightly with me and gave me advice and taught me stuff. I love him so much. It was then we went over my fight a bit on my phone. I think….what did I do after that? I think I taught a private lesson to Maria. Then we went to Sarah Moras’ cheesecake party and I ate a crap ton of delicious cheesecake. Then Serena and I watched the UFC at the Alehouse with Jojo! That was fun. 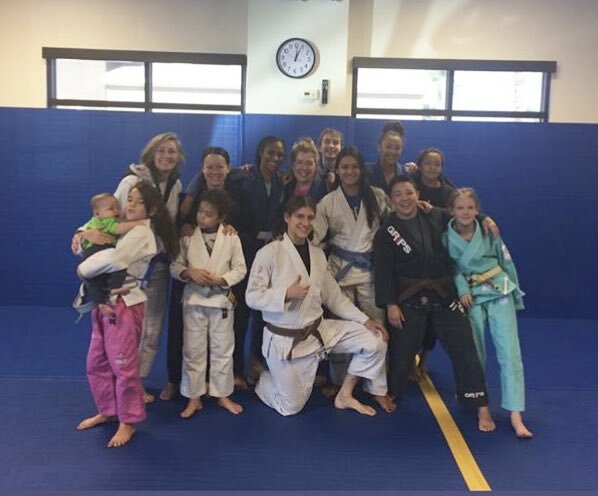 Sunday, I did my yoga, and went to women’s open mat at Dunham’s! It was great to see Annie again! <3 So nice! I miss you! And I learned a detail on a technique. Thanks! This week I got back into jiujitsu class with Mike. Coach John is back, but I’m still avoiding any strikes to the head. I think Thursday I’ll drill super lightly with headgear on. I feel pretty good physically, and emotionally, a little better. I’m together with my rat pack and getting stuff done. I put myself in lots of positive situations and am looking towards the future. I’m taking steps towards my new goals. I adore this theme song for My Hero Academia and I memorized it in Japanese so I can sing out loud! It make me excited to face my day! Here are the lyrics, and I embedded the music video below.